Dancer, performer, choreographer and musician Michael Flatley is World Champion Irish Dance. He not only created Lord of the Dance, but as well the world famous Riverdance. He manages to inspire an international audience with magical Irish folk and Irish-Celtic music. The world premiere of the famous Irish dance show took place on July 2, 1996 at the Point Theatre in the Irish capital Dublin. The music is written by Ronan Hardiman. 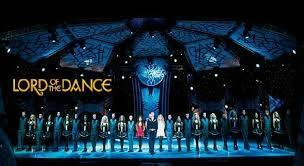 Michael Flatley's Lord of the Dance is one of the best known and best dance shows in the world. Until today the show attracted more than 75 million visitors. It is the first show of its kind that gave 21 sold-out screenings at London's Wembley Arena. Today are but even four groups simultaneously on tour in Japan, South Africa, Europe and the US. Lord of the Dance is a hymn to Ireland, its history and traditions with a handsome light show, dance and special effects. Central to the story is the enchanting jester, who is also the muse of the Lord of the Dance. If she blows her tin whistle, he comes to his strongest dance performances. A rival, however, can break the flute, and confronts. An army of bad guys wants to rob the Lord of the Dance of his title. After several battles and duels succeeds the Lord, with the help of Harlequin, to win his title back. And the good 'fairy' wins -as it has to be- at the end the heart of the Lord. Battle scenes are interspersed with merry dance scenes by dancers in bright, elfin outfits. They are a nice change and opposition to the powerful and structured army passages. The military drum with rigid men dances contrasts with the romantic atmosphere that the ladies put. The two dance soloists that fights to the heart of the Lord symbolize evil in obscure costumes, opposite to the good with cheerful fairytale outfits. In between there are energetic musical passages and ballads.